It is a new style of boot designed for precision and those all important split-decision moments. Think fast-paced games when everything is on the line. 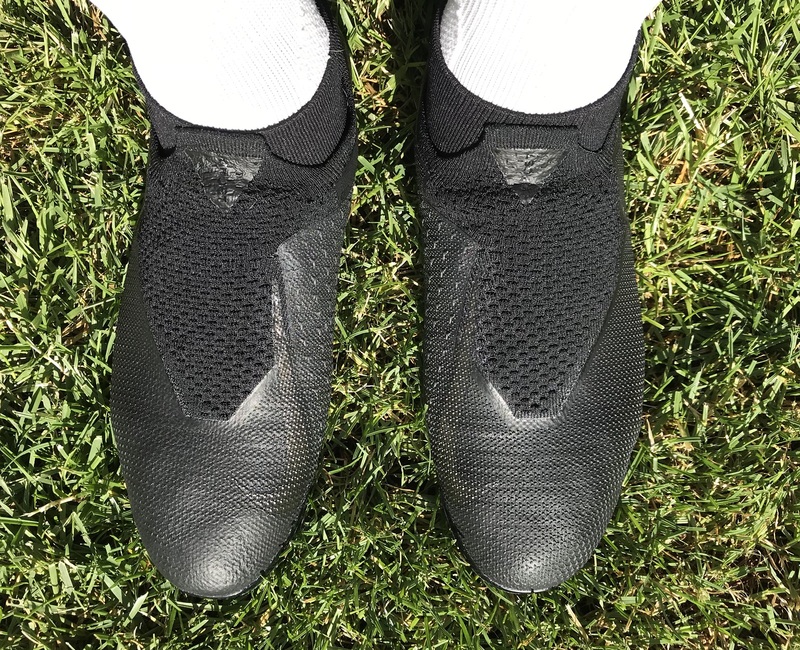 Since release, the Nike Phantom Vision has caused quite a stir with fans. 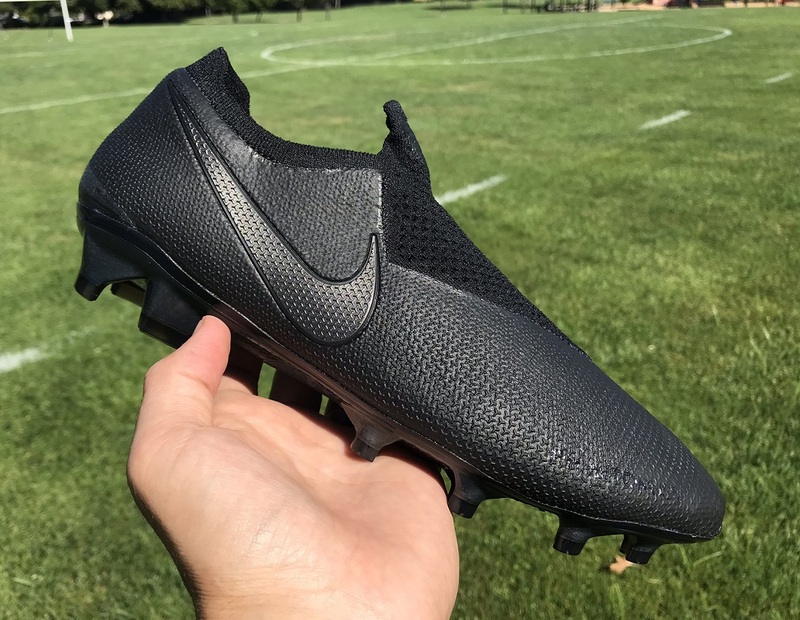 Not solely because they are a replacement for the Magista series, but because they feature key elements we haven’t seen from Nike before now. Comfort is high on the agenda, with Nike building them from the inside-out. In other words, foot shape and feel through a 90 minute game got serious consideration. They started the process by creating an internal Quadfit mesh, before focusing on the outer layers of the boot. The end result is intended to be a game changer. But, how does that all play out in reality? Find the Nike Phantom Vision available at soccer.com. Right away, it is apparent that Nike are trying something very different with this release. From their focus on comfort to building from the inside-out, the design team definitely looked at the Phantom Vision in a very different way. The intro blackout colorway is extremely slick, offering players a taste of what to expect without giving up final design cues. This is another first from Nike that bucks the norm, while giving you something to get excited about! Yes, the Magista series has been retired, with the Phantom Vision its replacement. But, that is not to say it is a direct replacement. Both silos are very different in design and target market. If you were a big fan of the Magista series, now is time to stock up on pairs. Rather than having an individual “Quadfit Mesh” section, I’m going to focus on it here along with the fit and comfort. It makes more sense since it plays such a huge role in how these boots feel on foot. 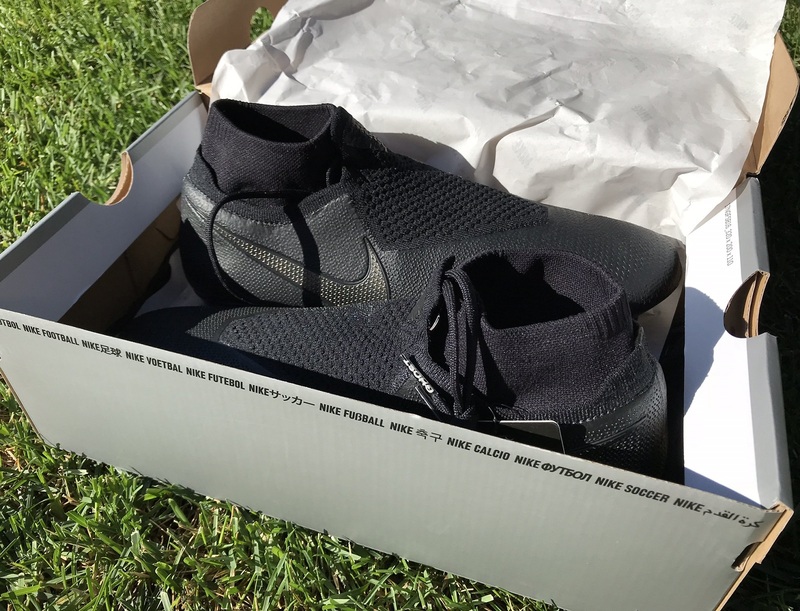 Nike started out with what is essentially a “bootie”, or an internal sleeve that your foot slips into. The idea is that this allows the fit to conforms with most any foot. Quadfit is designed to contain the foot without constricting it, while also retaining its shape over time without overstretch. So, although you can’t see the Quadfit Mesh from the outside, it plays a huge role in player experience with the boot. When you slip them on for the first time, the boot absolutely hugs your foot. My first time trying them on, I found everything to be very tight, with pressure right around my foot. Through the first wear, I chose to take them off as I didn’t feel naturally fitted to them. Or maybe it had more to do with the fact that I haven’t worn such a secure fitting boot before. Either way, it took a few wears before I felt like they were as one with my feet, ready to master a 90 minute game. Inside, you also get a Nike grip insole that helps give you added security through quick turns and sharp movements. Nike do emphasize the fact they hug your foot securely in place, so I can completely verify that as accurate statement. So, comfort for me was up in the air. For players that enjoy a snug fit, they should be absolutely perfect. You get extra stretch from both the inner and outer materials, but even so the bootie always stays locked around your foot. More on the fit below. Without a doubt one of the key features of the Phantom Vision is the “Ghost” laces. 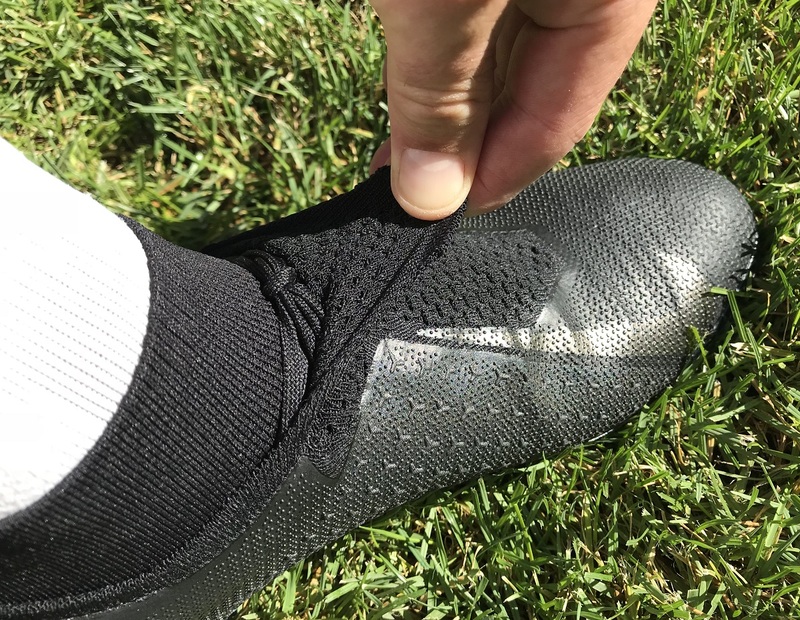 In some of the release videos, you may have spotted players pulling the front tongue tab forward and tucking their laces in underneath. Because of the design, there is no way to see what is underneath even when you pull the layers open as wide as you can. And that is why we turn directly to Nike and the image below for more details on the actual lacing system under the knit cover. And as you can see, it only navigates across your foot twice, very unique. 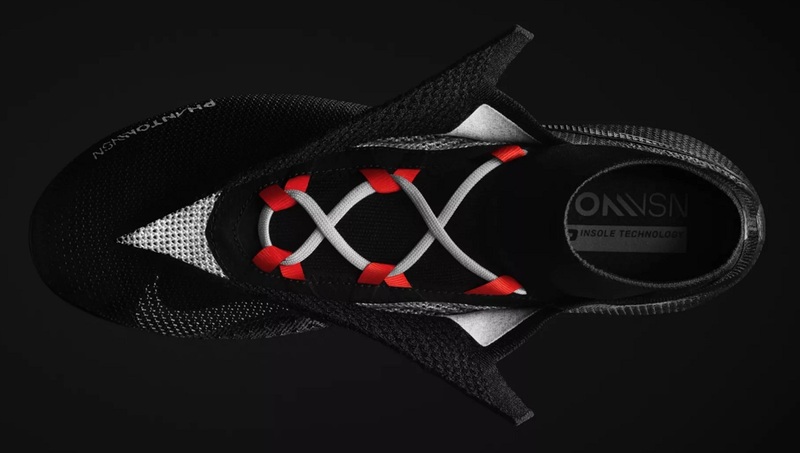 The layer under the laces is part of the Quadfit mesh fit system, while there is a knit material above. The knit material above is where the Ghost tab sits, with a lot of stretch so you can pull it forward as you tighten the laces. Once you have them tied, it is very easy to stuff (or tuck) everything under the tab, hidden from view. This gives them a laceless look, with the benefit of being able to dictate how tight you want the fit to be. My one concern with the overall design would be what happens when you want to relace them? I can’t see the process of re-looping being very easy. But then again, there isn’t a real need to relace unless the current pair in the boots breaks. There would be no reason to switch out the color or go with an extravagant design seeing as it is hidden during play. Moving onto the collar, and what is already the one key piece we are receiving most questions about. It is actually part of the Quadfit Mesh fit system, although it doesn’t play the most important role. It is still listed as providing a dynamic fit, although not in the same fashion as any previous Nike release. Here, the material feels more like an extra sock that runs around the ankle. First time out, it was actually tough to slip into them and that was related to the narrow opening. After a few wears, it has become slightly easier, but overall the material still fits very snug. Because of its design and overall shape, I can’t see it losing its shape over time, so they should continue to fit well right through wear. Another unique feature is how you can tuck it into the boot, producing a more traditional style ankle cut design. You are not going to want to do this, but I thought it looked fun – thus the image below. Oh boy is there a lot of texturing right throughout the upper of the Phantom Vision, all intended to enhance feel on the ball. Through the instep, in what is a triangle-shaped area, you will find a dominant raised pattern intended to improve control. Think of this element as a hybrid CTR360 addition, where Nike looks to enhance short and long-range control. The forefoot outside of the triangle also features a similar pattern, but it is much less pronounced, with the material feeling more pliable. Still, you get an almost sandpaper like feel that adds definition on the ball. 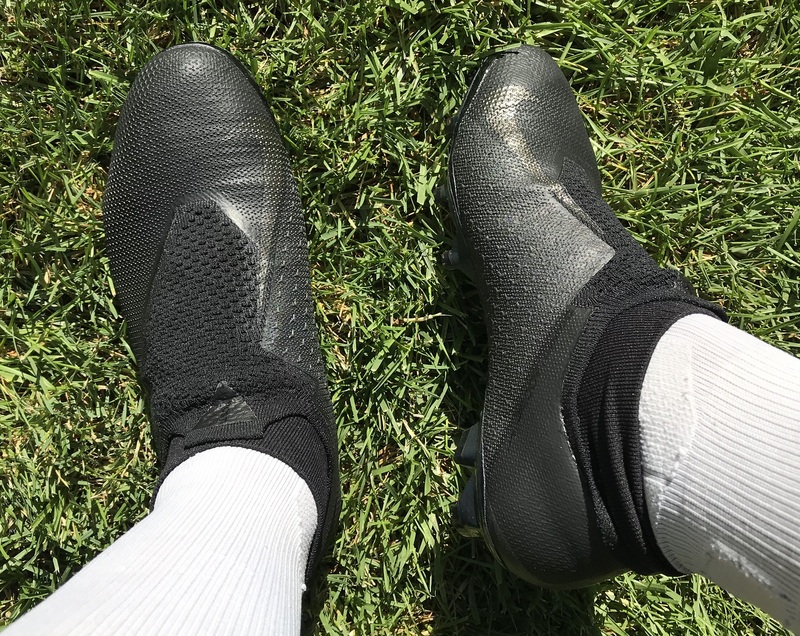 In terms of touch and control, they are a dream boot. In play, I could feel the ball staying closer to my foot and the additional tacky feel allowed for more defined touches in tight spaces. Although definitely not a power boot, they are a perfect striker or shooting style boot. The ball really pings off the surface and you get the bonus of being able to really connect with the ball, adding swerve, on more guided shots. And you also get the bonus of having 2 layers between the ball and your foot, ensuring the boot absorbs more impact than you foot! Finally, PhantomVSN is designed to perform in the elements with ACC (All Conditions Control) coating weather-proofing the final product. So, you know they are ready for use in all-weather conditions. Underfoot, Nike has created what is a very aggressive traction system with an almost futuristic appearance. It is very different to what we have seen them implement on other recent silo releases. 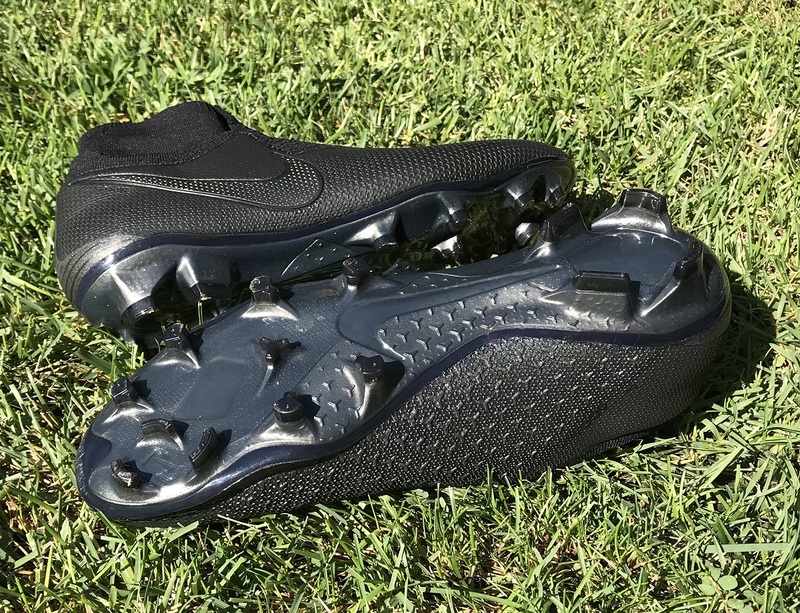 The overall purpose of the traction pattern is to accommodate quick multi-directional cuts and it plays out very well in play. One of the most unusual inclusions is a set of rotational blades right under the big toe region. Each blade is offset with the intent of catching the surface through a movement easing the pressure on your foot and allowing you to focus on quick acceleration. The images below give you a better idea of the design rather than trying to describe what is where. The all important question is how do they feel in play? I’ve got to admit, I very much enjoyed what they had to offer in all situations. There wasn’t any discomfort, with the overall pressure distributed very evenly. And the pattern seemed to grab the surface and release easily without any noticeable sticking. A quality system that I’m confident a wide variety of players will enjoy. 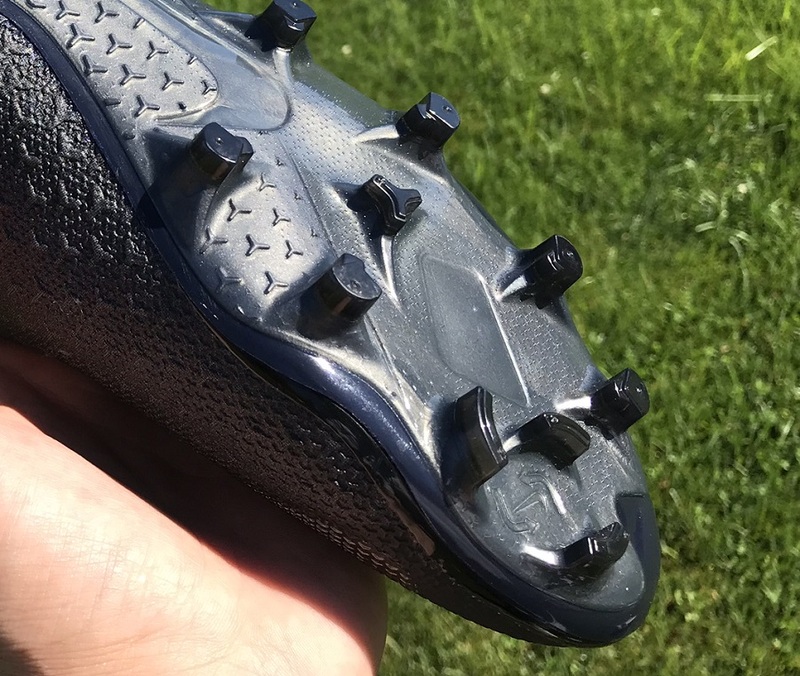 Final note here, the studs are housed on a lightweight, responsive plate with enhanced zonal support for the foot. You are going to want to order true to size, or what you would normally wear in Nike boots. I definitely wouldn’t vary your size choice, because ultimately the length is very similar. And they can very easily accommodate a medium/wide fit, almost moving into the side fitting category. But there is a twist. 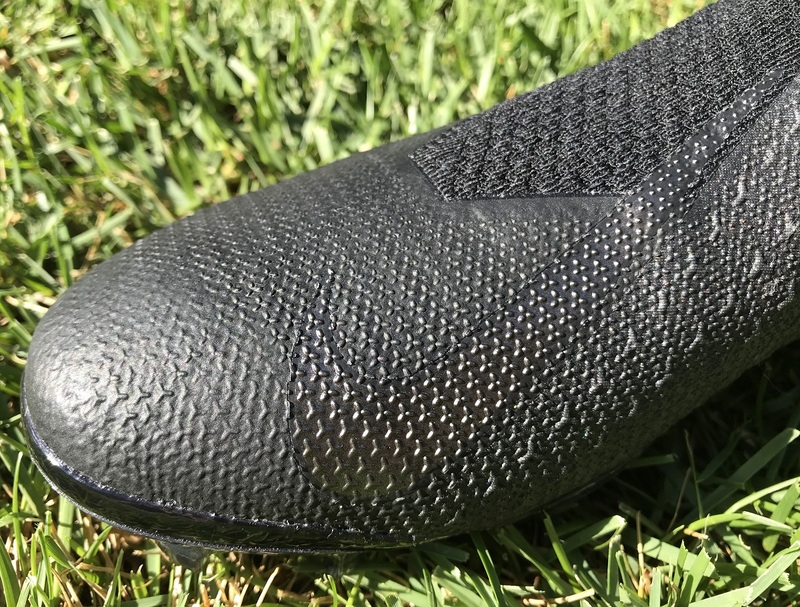 How they plays out on feet might be different to what you expect, because of the Quadfit Mesh system and that bootie. Ultimately, they are a snug boot that really does hug your foot. If you don’t enjoy the feel of a boot locked up against your foot, they probably won’t be the ideal boot choice for you. 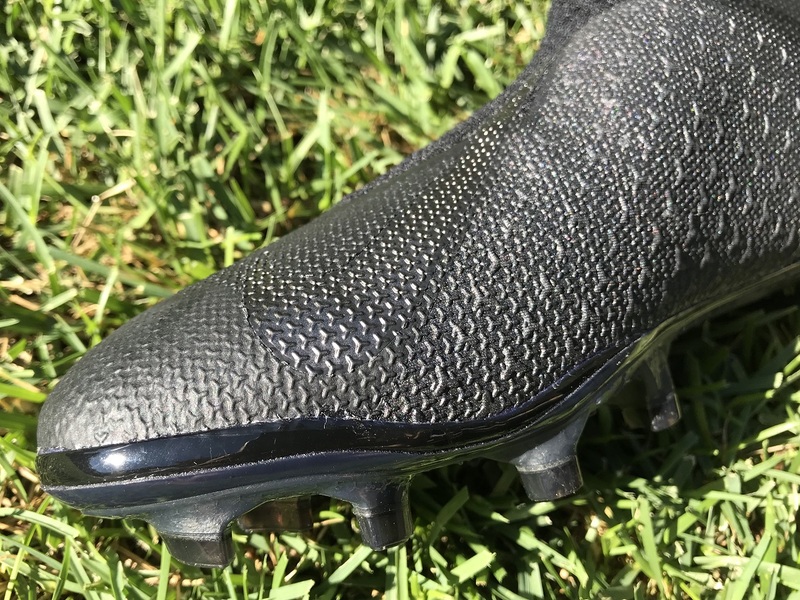 But if you are the type of player that wants to feel completely in sync with your boot in an incredibly secured fashion, these are going to be a quality choice! When it comes to durability, it really is tough to give an accurate answer on how long a boot will last. You have to go off smaller subset of evidence and try to make best estimates. From testing, there is 2 things I am pretty certain about here. First, the upper to soleplate joining will not separate; if it does you are probably kicking the ground more than the ball. 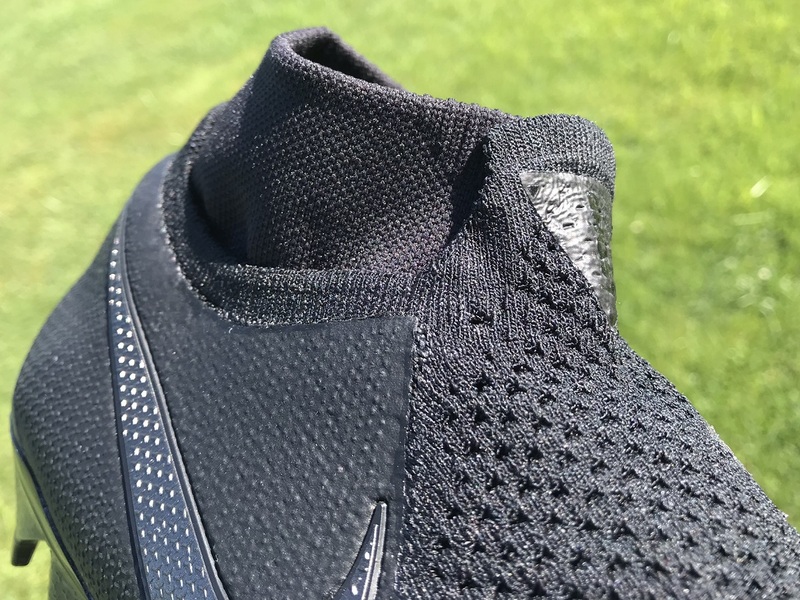 Nike has added an extra layer of material right around the lip that locks the connection shut, not even allowing a blade of grass to wedge into during play. Huge positive, great addition. But I’m a little at odds about the durability of the upper, the second thing. Through wear, my blackout pair has scuffed in areas and you can tell they have taken a beating already. That is not to say that they won’t last an entire season, but I can see opposing player’s blades causing some issues over time! First, you need to understand the concept of the boot before you splash out on a pair. They are designed to be ultra snug, for both wide and narrow fitting players. If you are good with that, move forward. From a personal perspective, I needed to go through an adjustment phase to really connect with how they felt on foot. For others, the process might be a lot quicker, but don’t be afraid to ease yourself into a pair if needed. 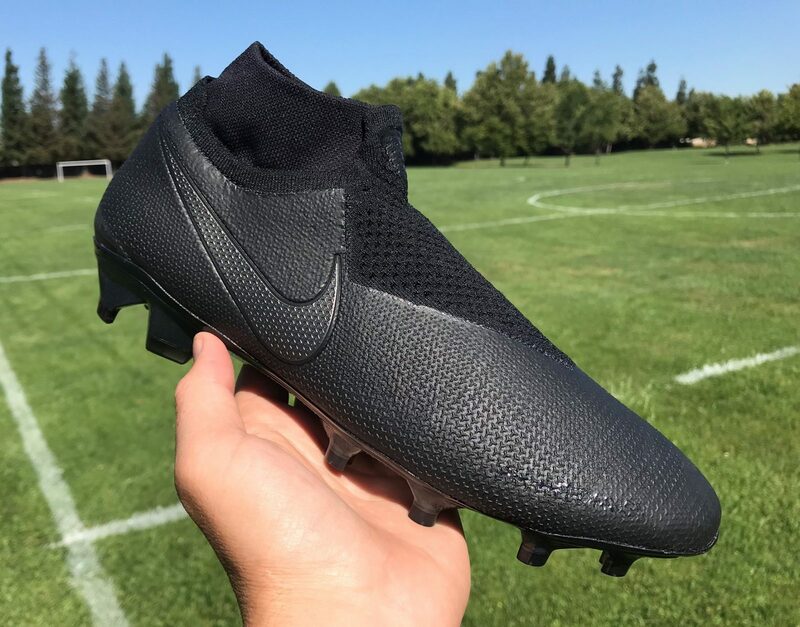 Releasing a new boot in a blackout colorway is definitely a first for Nike, usually they like to showcase their new releases right from the beginning. The difference here is that they seem to want people to take a look at them in a different way, understand the concept of the boot and experience them in the purest way before making judgement. That is something I very much appreciate. You can find this release version available for $274.99. If you need a splash of color, Nike has already unleashed a second version as part of the their Raised On Concrete pack. They are set to become available in the next few days. 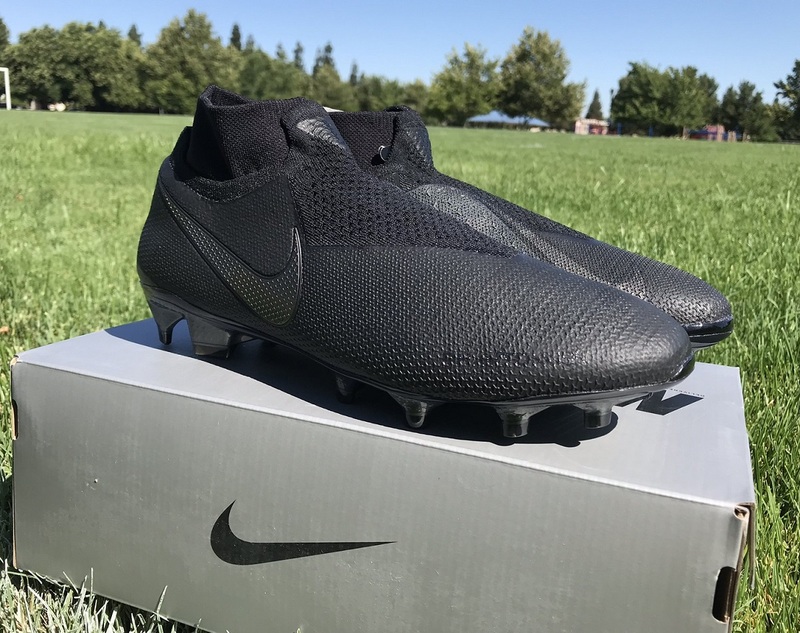 Highlight: A complex release, the Nike Phantom Vision is a boot “built from the inside-out.” Comfort is the priority, with Nike labelling them as a match-ready boot right out of the box. Category: Control/Agility – designed for a player who has mastered the art of navigating tight spaces with an eye for attack. Would I Buy Them: I definitely enjoyed my experience with them and will look to wear them again in the future. If you are considering buying a pair, definitely consider the fact they are designed to fit snug before forking over a ton of money for them. Player Position: There is a focus on playmakers with these, similar in a sense to the CTR360 Maestri series, only in a more advanced fashion. 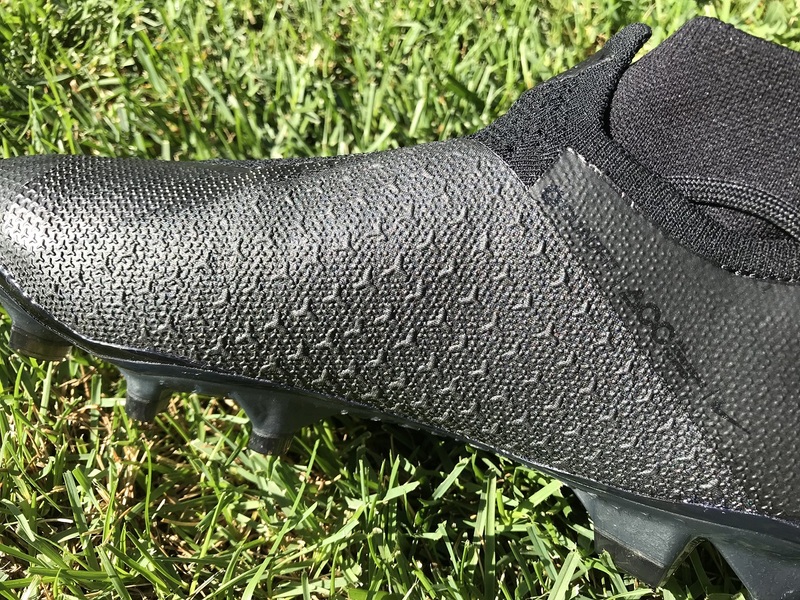 Are you aware if Nike is going to be releasing a turf version of this boot? What is the difference between pro and elite phantom??? They are decently similar performance wise, but the materials used are different. I'll have a post detailing the differences soon! Should I wear these boots as a striker? Thank you! !